Highway 20 is a time machine. An east-west corridor a few roads north of the bustling Interstate 90, along which we now live, Highway 20 is less traveled than the freeway, which goes eventually to Boston, and also than Highway 2, which goes to the faux-German village of Leavenworth and various other agricultural destinations. Highway 20 goes up and up, past a series of hydroelectric dams to a pass that’s closed for half the year. In months when you can keep driving, you wind through miles of fire-scorched wilderness and forgotten tiny towns, finishing within sight of the Idaho state line. It’s a grand trip. Not that we’re going so far today. This morning, at the misty-grey end of September, we’re destined for Concrete, Washington, in the foothills of the North Cascade Mountains. Concrete, named for one of its original exports, is a small town, much smaller even than Kandern, but the highway carries me back in time as we drive along it, to a moment when Concrete was the big city. I grew up even further up this highway, where the Skagit River Valley narrowed and deepened, living in the eternal shade of evergreens and high hills. To eight-year-old Kristi, Concrete meant Little League and roller skating, grocery stores and bigger restaurants. More critically, it meant Church. We’d make the fifteen-mile drive down the valley several times a year, canceling our tiny house church service for some special occasion, like a Christmas pageant or a baptism Sunday, at Concrete Community Bible Church. We arrive at Concrete Community Bible Church a few minutes before Sunday School, where Timmy and I have the privilege of sharing about our last two years at Black Forest Academy. Its white, friendly facade looks as genial as ever, and inside it’s no different. The last time I visited, in the summer of 2013, I was planning our wedding; today I arrive with my husband, quite obviously pregnant. At every turn we’re greeted effusively, some faces familiar and others less so, by people who’ve read our emails or prayed over our printed names in the bulletin. By the time we get up to speak, I’ve already shared our story half a dozen times, and from the front of the room my usual nervousness gives way in the glow of their welcoming excitement. There are many kinds of communities. I often write about the transience of life at BFA. Friendships, community, churches–they are ever-changing, each year and season different from the last. While it’s marvelous to see God shaping each BFA for its specific moment in time, here at Concrete CBC I find a different marvel: the beauty of continuity. It’s continuity for me–there are people here who have truly known me since I was eight years old, and can trace the twisting paths that have brought me to this point–but it’s far greater than that. Here are decades of relationship, generations living, growing and loving in this tiny town in the Upper Skagit. I listen to their prayer requests and praises, their words of encouragement for one another, with the feeling of eavesdropping on a much longer conversation. 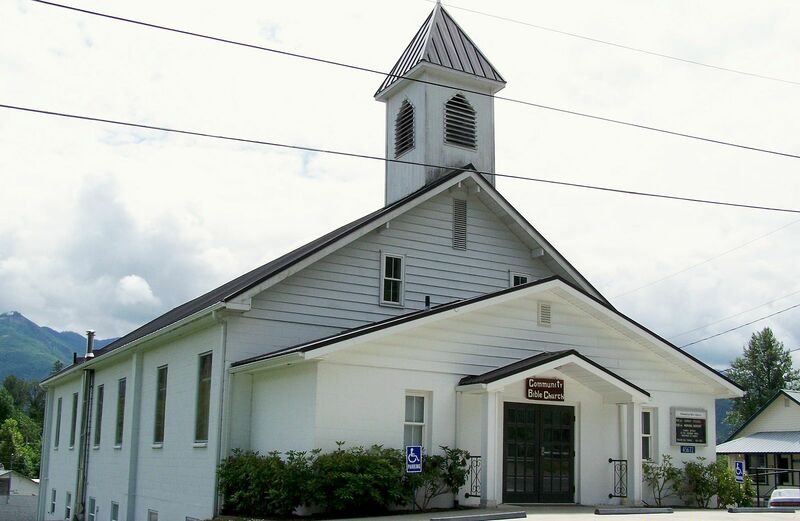 This congregation, led by the same devoted pastor for the past 23 years, knows one another well, year after year living out their calling as the body of Christ in this little town. I suppose it’s easy for transience to be jealous of continuity, but I’m not today. I can join in this service, singing songs to the God we all worship together, with neither the scorn of the willful nomad nor the envy of the perpetual exile. Because this place is home for me, too, even if it’s just for today, our time machine Sunday on Highway 20.